A division of the Goths is first attested in 291. [a] The Tervingi are first attested around that date; the Greuthungi, Vesi, and Ostrogothi are all attested no earlier than 388. The Greuthungi are first named by Ammianus Marcellinus, writing no earlier than 392 and perhaps later than 395, and basing his account on the words of a Tervingian chieftain who is attested as early as 376. The Ostrogoths are first named in a document dated September 392 from Milan. Claudian mentions that they together with the Greuthungi inhabit Phrygia. According to Herwig Wolfram, the primary sources either use the terminology of Tervingi/Greuthungi or Vesi/Ostrogothi and never mix the pairs. All four names were used together, but the pairing was always preserved, as in Gruthungi, Ostrogothi, Tervingi, Vesi. That the Tervingi were the Vesi/Visigothi and the Greuthungi the Ostrogothi is also supported by Jordanes. He identified the Visigothic kings from Alaric I to Alaric II as the heirs of the fourth-century Tervingian king Athanaric and the Ostrogothic kings from Theodoric the Great to Theodahad as the heirs of the Greuthungian king Ermanaric. This interpretation, however, though very common among scholars today, is not universal. According to the Jordanes' Getica, around 400 the Ostrogoths were ruled by Ostrogotha and derived their name from this "father of the Ostrogoths", but modern historians often assume the converse, that Ostrogotha was named after the people. The Gothic name makes its first appearance sometime between 16 and 18 AD with earlier indications related to the Guti of Scandia or possibly attributable to the Gutones. Procopius wrote of the Gauts in Thule and Cassiodorus mentioned the Gauthigoths amid his list of Scandinavian peoples. Two distinct groups of Gothic peoples are first attested to in 291, the western Tervingi-Vesi and the eastern Greutungi-Ostrogothi. "Greuthungi" may mean "steppe dwellers" or "people of the pebbly coasts". The root greut- is probably related to the Old English greot, meaning "flat". This is supported by evidence that geographic descriptors were commonly used to distinguish people living north of the Black Sea both before and after Gothic settlement there and by the lack of evidence for an earlier date for the name pair Tervingi-Greuthungi than the late third century. While none of the eastern Germanic languages are still spoken, Gothic is the only one with "continuous texts" remaining. Singularly the most important work amid the surviving Gothic texts is the translation of the Bible by the Visigothic bishop Ulfilas, comprising the earliest remnants of the Germanic languages known. Smatterings of the Gothic language can be found in Italian but its presence is minimal. A language related to Gothic was still spoken sporadically in Crimea as late as the 16th and 17th centuries (Crimean Gothic language). Much of the disappearance of the Gothic language is attributable to the Goths' cultural and linguistic absorption by other European peoples during the Middle Ages. The rise of the Huns around 370 overwhelmed the Gothic kingdoms. Many of the Goths migrated into Roman territory in the Balkans, while others remained north of the Danube under Hunnic rule. Frequently the Ostrogoths fought alongside both Alans and Huns. It was the Ostrogoths who were first subdued by the Huns. Like other tribal peoples, they became one of the many Hunnic vassals fighting in Europe, as in the Battle of Chalons in 451. Several uprisings against the Huns were suppressed. The collapse of Hunnic power in the 450s led to further violent upheaval in the lands north of the Danube, during which the Ostrogoths expanded slowly southwards into the Balkans, and then westwards towards Illyria and the borders of Italy. Their rule was marked by turmoil with hostile neighbors all around and the land they acquired between Vindobona (Vienna) and Sirmium (Sremska Mitrovica) was not well managed, a fact which rendered the Ostrogoths dependent upon Constantinople for subsidies. Their recorded history begins with their independence from the remains of the Hunnic Empire following the death of Attila the Hun in 453. Now allied with the Huns' former vassals, the Gepids, the Ostrogoths under Theodemir broke the Hunnic power of Attila's sons in the Battle of Nedao in 454, although the Ostrogoth contribution to the battle's success was minimal. The greatest of all Ostrogothic rulers, the future Theodoric the Great (whose Gothic name meant "leader of the people") of Ostrogothic Kingdom (Regnum Italiae, "Kingdom of Italy")[b], was born to Theodemir in or about 454, soon after the Battle of Nedao. His childhood was spent at Constantinople as a diplomatic hostage, where he was carefully educated. The early part of his life was taken up with various disputes, intrigues and wars within the Byzantine empire, in which he had as his rival Theodoric Strabo of the Thracian Goths, a distant relative of Theodoric the Great and son of Triarius. This older but lesser Theodoric seems to have been the chief, not the king, of that branch of the Ostrogoths that had settled within the Empire earlier. Theodoric the Great, as he is sometimes distinguished, was sometimes the friend, sometimes the enemy, of the Empire. In the former case he was clothed with various Roman titles and offices, as patrician and consul; but in all cases alike he remained the national Ostrogothic king. Theodoric is also known for his attainment of support from the Catholic Church and on one occasion, he even helped resolve a disputed papal election. During his reign, Theodoric, who was an Arian, allowed freedom of religion, which had not been done before. However, he did try to appease the Pope and tried to keep his alliance with the church strong. He saw the Pope as an authority not only in the church but also over Rome itself. His ability to work well with the Italy's nobles, members of the Roman Senate, and the Catholic Church all helped facilitate his acceptance as the ruler of Italy. The Ostrogothic dominion was once again as far-reaching and splendid as it was in the time of Hermanaric; however it was now of a wholly different character. The dominion of Theodoric was not a barbarian but a civilized power. His twofold position ran through everything. He was at once king of the Goths and successor, though without any imperial titles, of the Western Roman emperors. 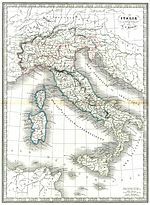 The two nations, differing in manners, language and religion, lived side by side on the soil of Italy; each was ruled according to its own law, by the prince who was, in his two separate characters, the common sovereign of both. Due to his ability to foster and leverage relations among the various Germanic kingdoms, the Byzantines began to fear Theodoric's power, which led to an alliance between the Byzantine emperor and the Frankish king, Clovis I, a pact designed to counteract and ultimately overthrow the Ostrogoths. In some ways Theodoric may have been overly accommodating to both the Romans and other Gothic people as he placated Catholics and Arian Christians alike. Historian Herwig Wolfram suggests that Theodoric's efforts in trying to appease Latin and barbarian cultures in kind brought about the collapse of Ostrogothic predominance and also resulted in the "end of Italy as the heartland of late antiquity." All the years of creating a protective perimeter around Italy were broken down by the Franco-Byzantine coalition. Theodoric was able to temporarily salvage some of his realm with the assistance of the Thuringians. Realizing that the Franks were the most significant threat to the Visigothic empire as well, Alaric II, (who was the son-in-law of Theodoric) enlisted the aide of the Burgundians and fought against the Franks at the urging of the magnates of his tribe, but this choice proved an error and he allegedly met his end at the hand of the Frankish king, Clovis. A time of confusion followed the death of Alaric II who was slain during the Battle of Vouillé. The Ostrogothic king Theodoric stepped in as the guardian of his grandson Amalaric, and preserved for him all his Iberian and a fragment of his Gallic dominion. Toulouse passed to the Franks but the Goth kept Narbonne and its district and Septimania, which was the last part of Gaul held by the Goths, keeping the name of Gothia for many years. While Theodoric lived, the Visigothic kingdom was practically united to his own dominion. He seems also to have claimed a kind of protectorate over the Germanic powers generally, and indeed to have practically exercised it, except in the case of the Franks. From 508–511 under Theodoric's command, the Ostrogoths marched on Gaul as the Vandal king of Carthage and Clovis made concerted efforts to weaken his hold on the Visigoths. On the death of Theodoric in 526, the eastern and western Goths were once again divided. By the late 6th century, the Ostrogoths lost their political identity and assimilated into other Germanic tribes. The picture of Theodoric's rule is drawn for us in the state papers drawn up, in his name and in the names of his successors, by his Roman minister Cassiodorus. The Goths seem to have been thick on the ground in northern Italy; in the south they formed little more than garrisons. In Theodoric's view, the Goth was the armed protector of the peaceful Roman; the Gothic king had the toil of government, while the Roman consul had the honour. All the forms of the Roman administration went on, and the Roman policy and culture had great influence on the Goths themselves. The rule of the prince over distinct nations in the same land was necessarily despotic; the old Germanic freedom was necessarily lost. Such a system needed a Theodoric to carry it on. It broke in pieces after his death. Meanwhile, the Frankish king Clovis fought protracted wars against various enemies while consolidating his rule, forming the embryonic stages of what would eventually become Medieval Europe. The weakness of the Ostrogothic position in Italy now showed itself. The Eastern Roman Emperor Justinian I always strove to restore as much of the Western Roman Empire as he could and certainly would not pass up the opportunity. Launched on both land and sea, Justinian began his war of reconquest. In 535, he commissioned Belisarius to attack the Ostrogoths following the success he had in North Africa against the Vandals. It was Justinian's intention to recover Italy and Rome from the Goths. Belisarius quickly captured Sicily and then crossed into Italy, where he captured Naples and Rome in December of 536. Sometime during the spring of 537, the Goths marched on Rome with upwards of 100,000 men under the leadership of Witiges and laid siege to the city, albeit unsuccessfully. Despite outnumbering the Romans by a five-to-one margin, the Goths could not loose Belisarius from the former western capital of the Empire. After recuperating from siege warfare, Belisarius marched north, taking Mediolanum (Milan) and the Ostrogoth capital of Ravenna in 540. 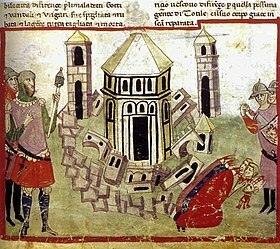 With the attack on Ravenna, Witiges and his men were trapped in the Ostrogothic capital. Belisarius proved more capable at siege warfare than his rival Witiges had been at Rome and the Ostrogoth ruler, who was also dealing with Frankish enemies, was forced to surrender, but not without terms. Belisarius refused to grant any concessions save unconditional surrender in view of the fact that Justinian wanted to make Witiges a vassal king in Trans-Padane Italy. This condition made for something of an impasse. As soon as Belisarius was gone, the remaining Ostrogoths elected a new king named Totila. Under the brilliant command of Totila, the Goths were able to reassert themselves to a degree. For a period of nearly ten years, control for Italy became a seesaw battle between Byzantine and Ostrogothic forces. Totila eventually recaptured all of northern Italy and even drove the Byzantines out of Rome, thereby affording him the opportunity to take political control of the city, partly by executing the Roman senatorial order. Many of them fled eastwards for Constantinople. By 550 Justinian was able to put together an enormous force, an assembly designed to recover his losses and subdue any Gothic resistance. In 551, the Roman navy destroyed Totila's fleet and in 552 an overwhelming Byzantine force under Narses entered Italy from the north. Attempting to surprise the invading Byzantines, Totila gambled with his forces at Taginaei, where he was slain. Broken but not yet defeated, the Ostrogoths made one final stand at Campania under a chief named Teia, but when he was also killed in battle at Nuceria they finally capitulated. On surrendering, they informed Narses that evidently "the hand of God was against them" and so they left Italy for the northern lands of their fathers. After that final defeat, the Ostrogothic name wholly died. The nation had practically evaporated with Theodoric's death. "The leadership of western Europe therefore passed by default to the Franks. Consequently, Ostrogothic failure and Frankish success were crucial for the development of early medieval Europe, for Theodoric had made it "his intention to restore the vigor of Roman government and Roman culture". The chance of forming a national state in Italy by the union of Roman and Germanic elements, such as those that arose in Gaul, in Iberia, and in parts of Italy under Lombard rule, was thus lost. The failures of the barbarian kingdoms to maintain control of the regions they conquered were partly the result of leadership vacuums like those which resulted from the death of Theodoric (also the lack of male succession) and Totila but additionally as a consequence of political fragmentation amid the Germanic tribes as their loyalties wavered between their kin and their erstwhile enemies. Frankish entry onto the geopolitical map of Europe also bears into play: had the Ostrogoths attained more military success against the Byzantines on the battlefield by combining the strength of other Germanic tribes, this could have changed the direction of Frankish loyalty. Military success or defeat and political legitimacy were interrelated in barbarian society. Of Gothic literature in the Gothic language we have the Bible of Ulfilas and some other religious writings and fragments. Of Gothic legislation in Latin we have the edict of Theodoric of the year 500, and the Variae of Cassiodorus may pass as a collection of the state papers of Theodoric and his immediate successors. Among the Visigoths, written laws had already been put forth by Euric. Alaric II put forth a Breviarium of Roman law for his Roman subjects; but the great collection of Visigothic laws dates from the later days of the monarchy, being put forth by King Reccaswinth about 654. This code gave occasion to some well-known comments by Montesquieu and Gibbon, and has been discussed by Savigny (Geschichte des römischen Rechts, ii. 65) and various other writers. They are printed in the Monumenta Germaniae, leges, tome i. (1902). ^ De Bello Gothico IV 32, pp. 241–245. ^ a b Wolfram 1988, p. 24, fn52. ^ a b c d e f g Wolfram 1988, p. 24. ^ Heather 1996, pp. 52–57, 300–301. ^ a b Burns 1984, p. 44. ^ a b c d Wolfram 1988, p. 26. ^ Wolfram 1988, p. 389, fn67. ^ Wolfram 1988, p. 20. ^ Burns 1984, p. 30. ^ a b Wolfram 1988, pp. 387–388, fn58. ^ Waldman & Mason 2006, p. 574. ^ a b Dalby 1999, p. 229. ^ Waldman & Mason 2006, p. 572. ^ Bury 2000, p. 25. ^ a b c Waldman & Mason 2006, p. 575. ^ Todd 1999, p. 177. ^ Bury 2000, p. 55. ^ Todd 1999, p. 178. ^ Burns 1984, p. 52. ^ a b c d e f De Puy 1899, p. 2865. ^ Backman 2008, p. 68. ^ Frassetto 2003, p. 338. ^ Frassetto 2003, pp. 338–339. ^ Cantor 1994, p. 109. ^ Waldman & Mason 2006, p. 665. ^ Waldman & Mason 2006, pp. 575–576. ^ Bury 2000, p. 178. ^ a b c d Waldman & Mason 2006, p. 576. ^ Wolfram 1997, pp. 218–221. ^ Wolfram 1997, p. 155. ^ Larned 1895, p. 134. ^ Wolfram 1997, p. 220. ^ Wolfram 1997, p. 225. ^ Collins 1999, pp. 116–137. ^ Wolfram 1988, p. 334. ^ Wolfram 1988, pp. 332–333, 337–340. ^ Wolfram 1988, p. 339. ^ Halsall 2007, pp. 500–501. ^ Halsall 2007, p. 501. ^ Oman 1902, pp. 89–90. ^ Halsall 2007, pp. 502–503. ^ Oman 1902, p. 91. ^ Halsall 2007, p. 503. ^ Bauer 2010, p. 208. ^ Bauer 2010, p. 210. ^ a b Halsall 2007, p. 504. ^ Oman 1902, pp. 95–96. ^ Cantor 1994, p. 105–107. ^ Halsall 2007, pp. 505–512. ^ Halsall 2007, p. 512. ^ a b Chisholm 1910, p. 275.